This week we are challenging you to add some snow to your project! Jo was inspired by SSS Frozen Fractals and Tim Holtz Urban Tapestry stamp sets to create a mixed media panel that could be made into a card or in this case used as the centre piece for an art journal page. 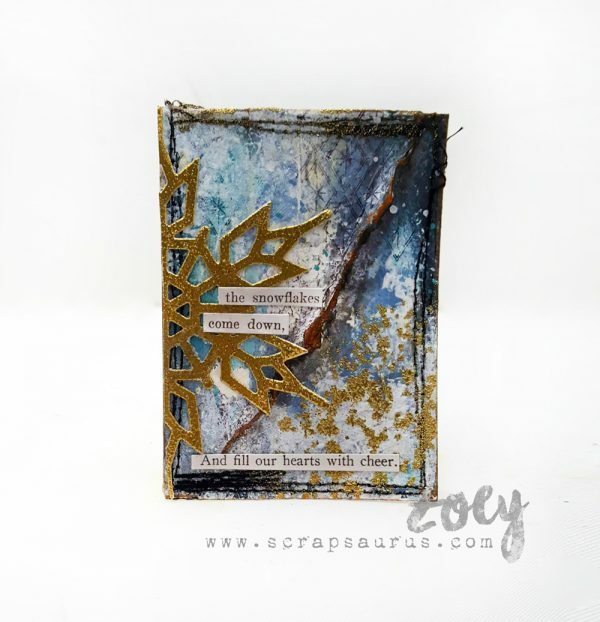 For this panel the Frozen Fractals are stamped with Stampendous white embossing powder, the background is coloured using Distress Inks, the Urban Tapestry stamps are stamped using Rich Cocoa Memento Ink and a brown Faber-Castell Big Brush marker, and then embellished with Tim Holtz Sizzix Garden Greens Thinlets, SSS Frozen Fractals Sequins and Icicle Stickles to add some sparkle. 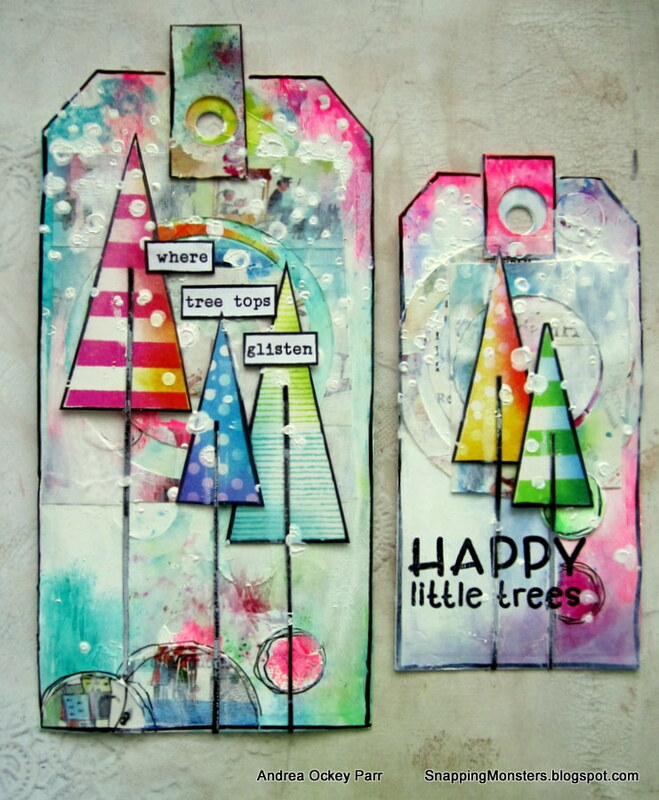 Andrea made two snowy tree tags featuring some great stamps: Reverse Confetti’s Triangle Trees, Hello Bluebird’s Typed Christmas, and Kindred Stamps’ Happy Accidents. 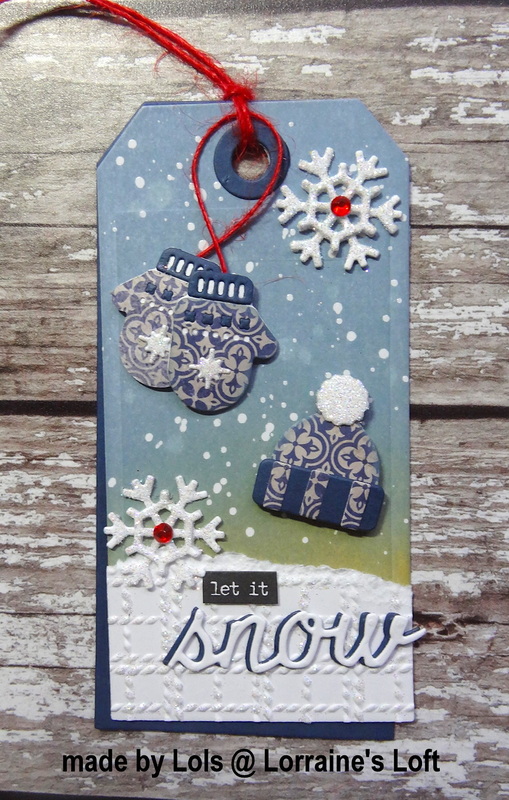 Anna-Karin made a snow-themed tag using a whole lot of embossing powder. 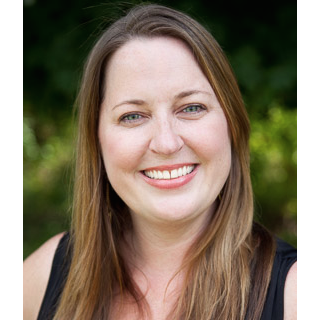 The entire background is embossed with various powders, such as Ranger’s Ultra Thick Embossing Powder and Simon Says Stamp White powder. 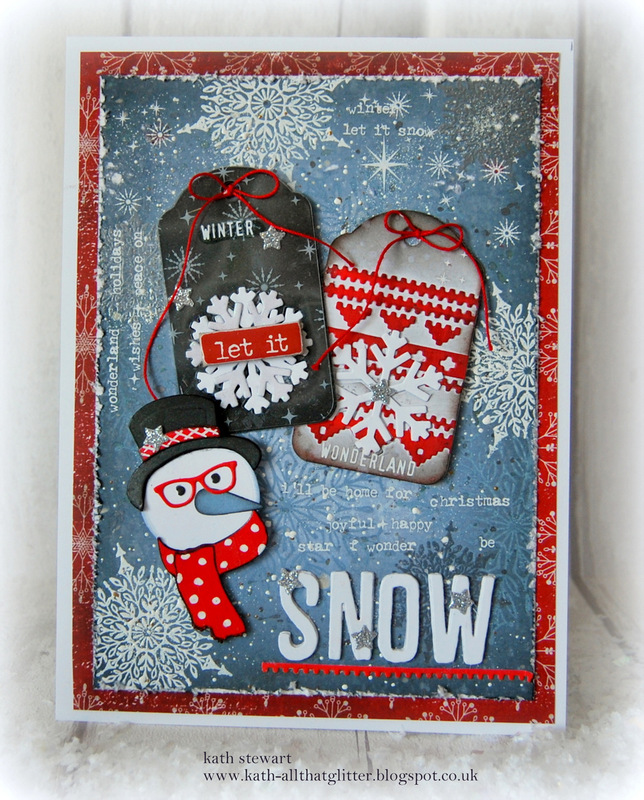 The Tim Holtz Sizzix Flurry 3 snowflake is embossed with Ranger’s Sea Mixed Media powder. 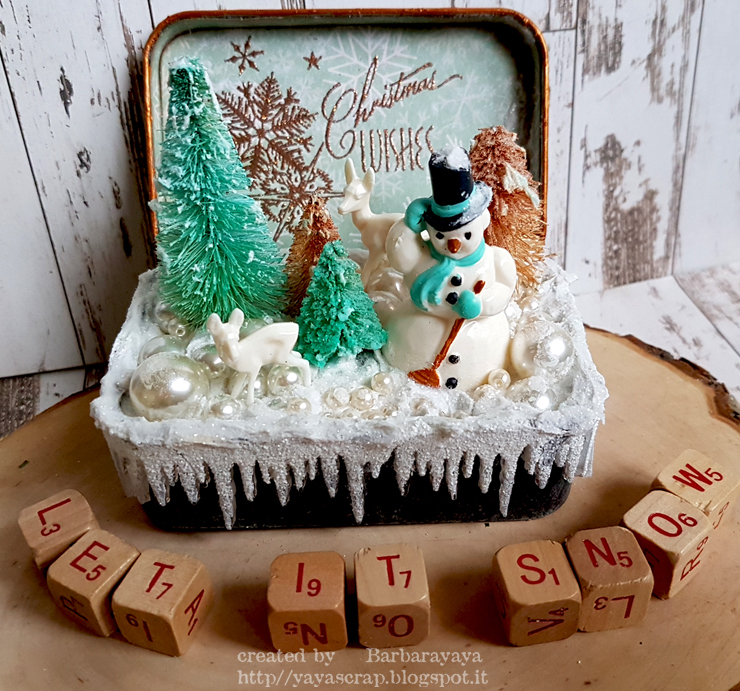 Barbara celebrate the advent of winter creating a home decoration made with Tim Holtz Idea-ology Trinket tins, Tim Holtz Idea-ology Salvaged Snowmen, Tim Holtz Stampers Anonymous Holiday Greetings and Distress Dry Glitter Clear Rock Candy. Cheiron created a card with layered snowflake dies using the Tim Holtz Sizzix Ice Flake, Flurry 2 and Paper Snowflakes Mini Snowflakes dies. 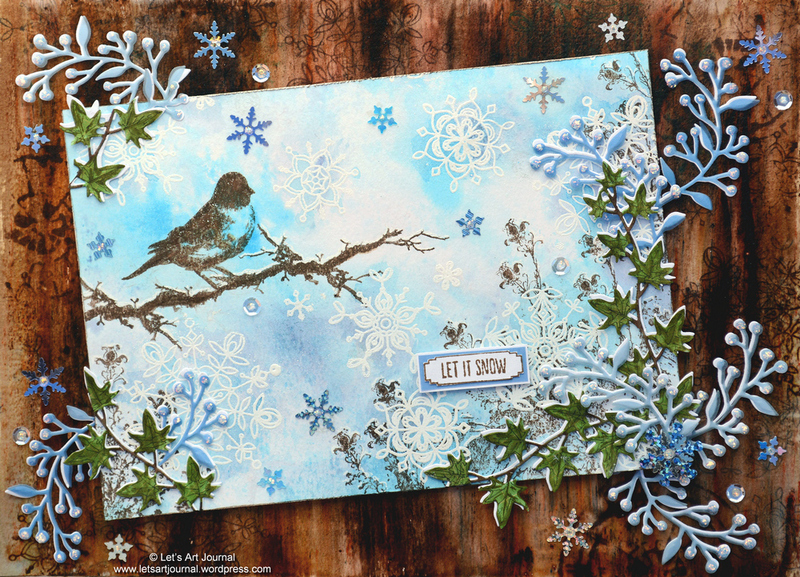 Her snowy background was created using the Kaleidoscope 3D Texture Fades Embossing Folder and Brushed Pewter Distress Paint and Tsukineko Sparkle Spray. Her sentiment was created with a Christmas Remnant Rub. 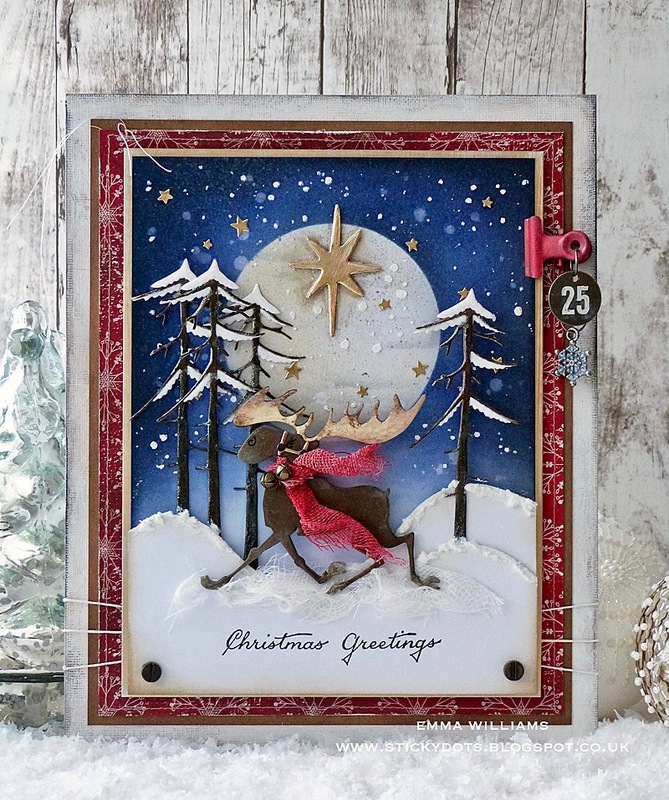 Emma‘s festive panel was inspired by Tim Holtz’s wonderful Merry Moose die. 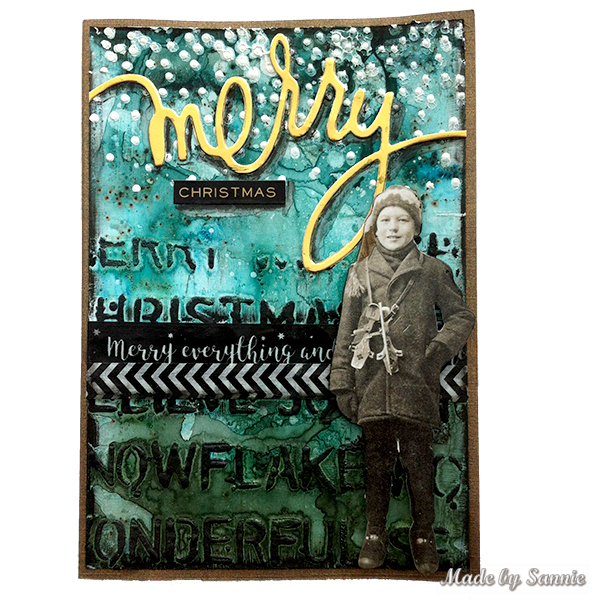 She placed him in a winter wonderland and added an inked background complete with a gold metallic die cut Snowy Star and finished the project with a stamped sentiment from the Tim Holtz Yuletide Stamp Set. Lols is aways scrambling to make last minute Christmas gift tags and this year she intends to be better organised. 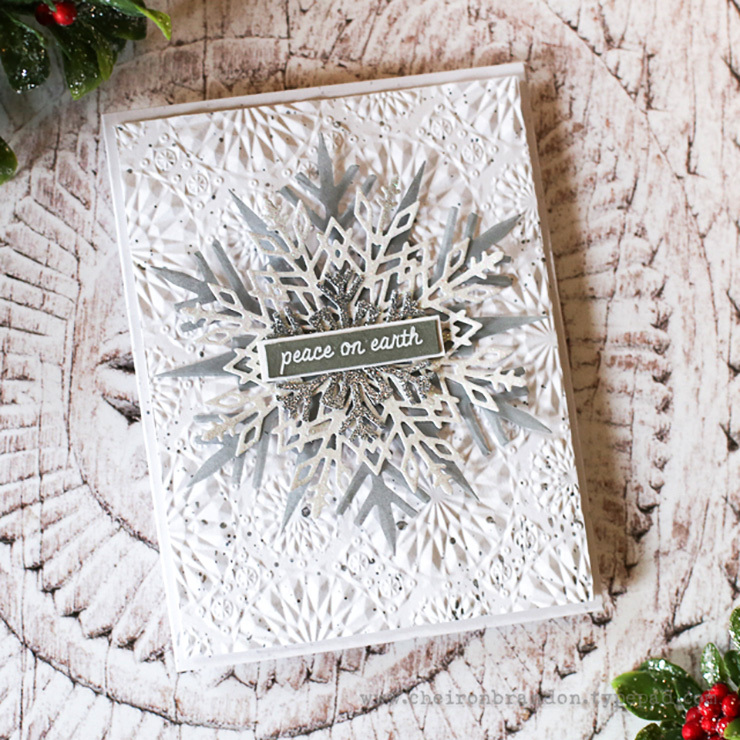 This fabulous Winter Side-Order Thinlits Die and Embossing Folder Set from Tim Holtz is perfect for making those essential tags! 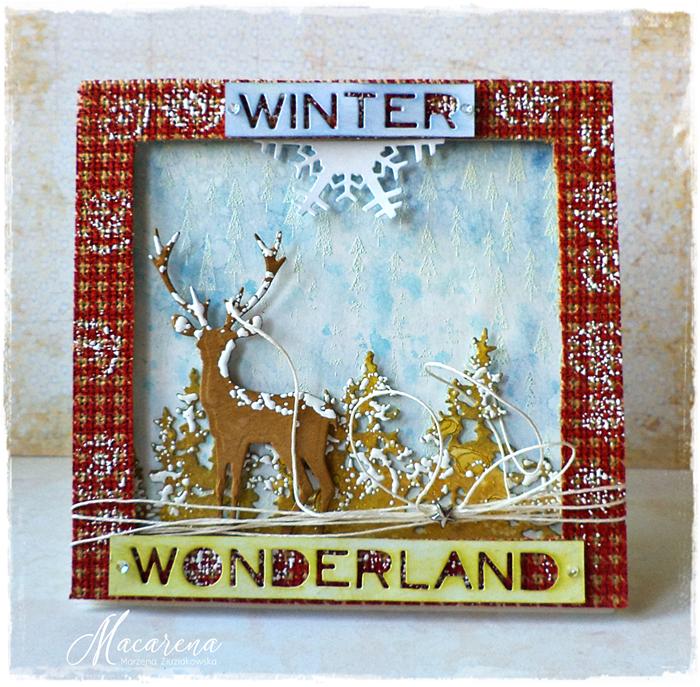 Macarena created a snowy winter scene using Stampendous Chunky White Embossing Enamel as the snow over the deer from Tim Holtz Sizzix Winter Wonderland die and Tim Holtz Sizzix Tree Line die. 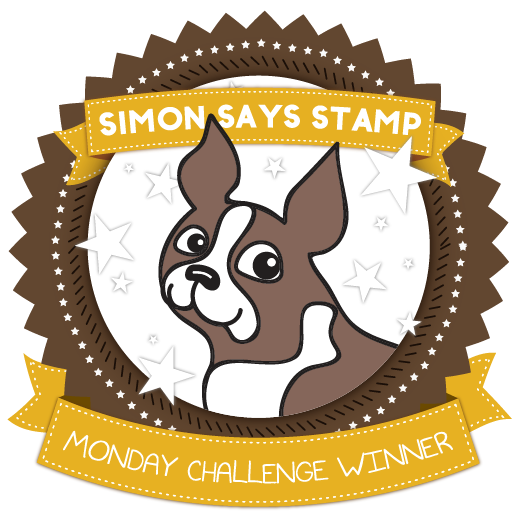 For her background she embossed Simon Says Stamp Mod Trees Background stamp. 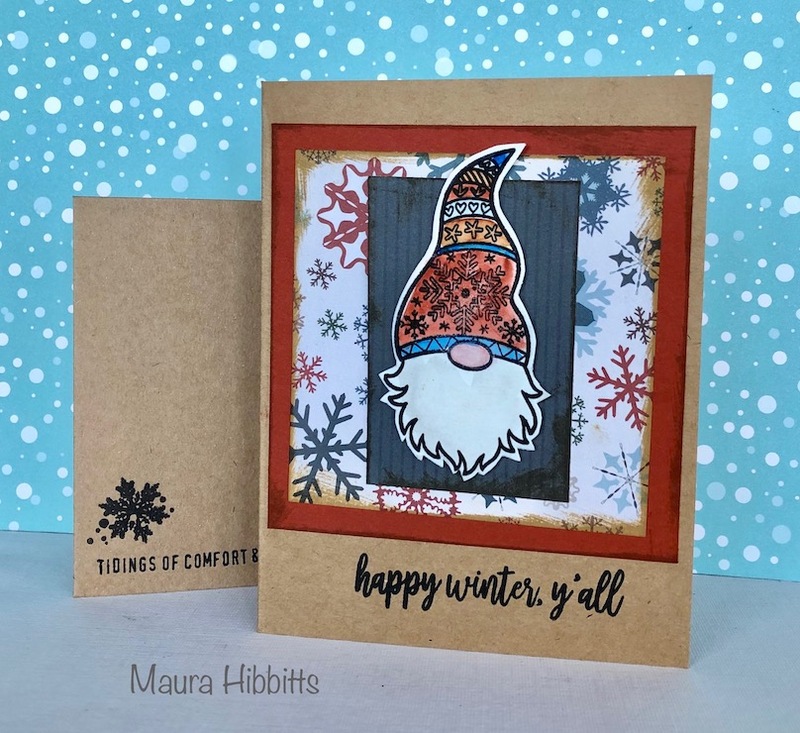 Maura got a head start on her Christmas cards with the Carta Bella Let it Snow paper pack, Visible Image Snow is Falling stamps, and the adorable winter gnome from Picket Fence Studios. 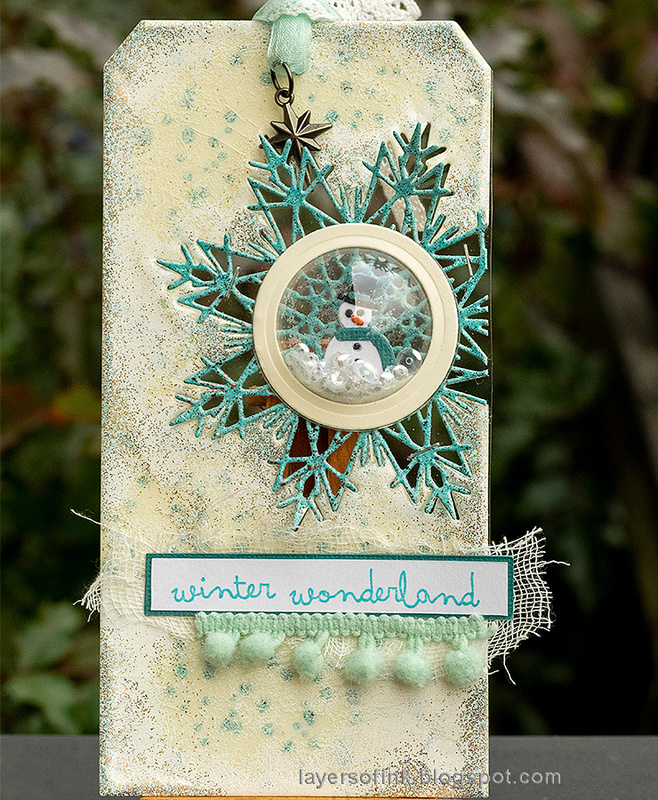 Meihsia was inspired to make a mixed media tag using Prima Marketing Snowflake Paste to create the snowy scene and decorated it with Tim Holtz Idea-Ology Wreaths Adornments. 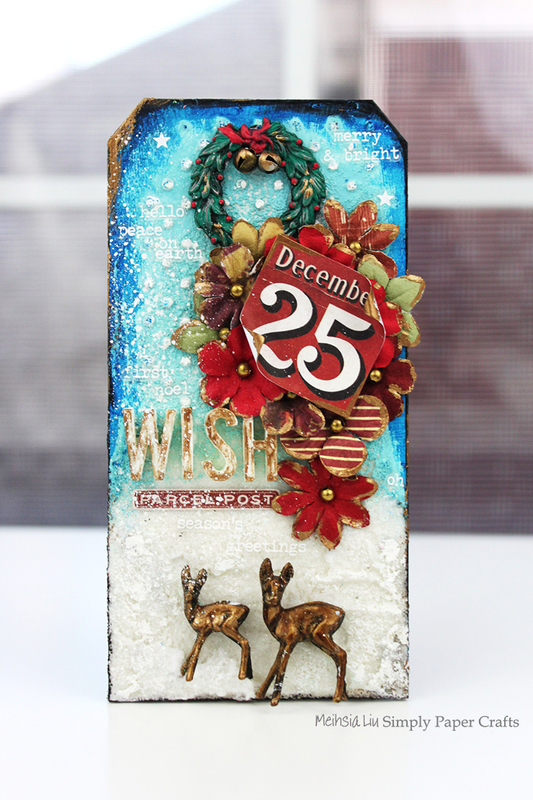 Sandra made a snowy Christmas card by using the Christmas stencil with Texture Paste and Black Gesso, and gave it all some color with Infusions and Nuvo Shimmer Powder. Lovely cards from the team. I really love Anna-Karin’s snowflake die and embossing. It’s beautiful.